Now…… there are loose ends to this too. These are things that, I think, are useful, but your mileage may vary. Two different teas, clearly. I don’t remember much about these, as they were taken quite a few years ago, but if I’m not mistaken, the top tea is probably younger than the bottom one, and is of the “smaller factory” variety. There’s not a whole lot that one can reliably tell from spent leaves alone, especially without the accompanying smells and tastes, but there are things that one can do to, for example, verify what was in the cup during the tasting. It can, in other words, help confirm or deny theories about the tea. Lengxiang — literally “cold aroma”, this is what’s left in the cup long after the tea has been consumed. It is not so useful, again, especially since lengxiang is rarely nasty (although it is possible). Nevertheless, another piece of the puzzle. Cold tasting — the later cups, for example, can also be drunk cold, or at least, cooled. I think sometimes when tasting tea that is too hot it is actually difficult to get much out of it — the aromas or the tastes can be obscured by the temperature. Cooling the tea down by waiting or other, more artificial means, can actually help enhance the sensory sensitivity. Now……. the last problem is of course price, but that, really, is a separate topic that I have talked about many times before. On that, no more. I only talked about tasting last time, and Walt rightly pointed out that you can’t divorce that from smell and other sensations. The reason I didn’t mention those was because I wanted to talk about them separately. Let’s start with smell. Smell, I think, is one of the most elusive and difficult to discuss traits of a tea. One problem with smell is that they are extremely fickle, and everyone has a different idea of what something smells like. Generally speaking, I find smell to be very unreliable in evaluating teas, especially things that are non-puerh. They are also harder to tell apart — so a cheap tieguanyin may not smell so different from an expensive one, so on, so forth. There are a few things that you can use smell for though. The first, I think, is storage condition for older teas, and not just puerh. Obviously, if a puerh has been traditionally stored, there’s often a traditional storage smell (which will manifest itself clearly in taste as well and appearance). Also, for newer, drier stored things, the smell can often give you some clue as to how the tea was made and what it’s like. Smelling dry leaves can be deceiving, however, whereas smelling wet leaves or brewed tea can give you a lot more info. I’ve been drinking some randomly purchased ~5 years old puerh recently, and some share a distinct “stale green tea” smell — teas that, I think, will not age well in the long run. Good puerh will have a solid change by 5 or so years, accompanied with a thickness and depth that is lacking in some of these “stale green tea” types. I can’t quite describe how they are like, but I know one when I see one. Aged oolongs can also be evaluated using smell, in this case partly thanks to how the tea has been stored — has it been roasted? Stored well? Does it smell sour? Aged? New pretending to be old? All those things, with experience, are at least somewhat discernable using smell. I think the same principles can be applied to every tea, to a greater or lesser extent, and smell acts as a confirmation signal — it can help you figure out things, but on its own, can be somewhat misleading. Now, the other aspects of tasting a tea is more ephemeral. I’m talking about what I normally call “depth,” which really means how a tea feels when drunk. There are two parts to this. One is a physical reaction on a sensory front — how a tea feels in the mouth, and how it feels down the throat. Good teas often will trigger a reaction in the throat area, as well as feeling very full and thick in the mouth itself. It coats the mouth with sensory stimulation that weaker teas do not provide, and this is often the difference between an ok tea and a great tea. The other is something even more difficult to describe, and which some will call “qi,” meaning energy/substance/stuff in Chinese cosmology. It is difficult to explain what it is, but I think the best way I can describe it is that it is a physical reaction to a tea that goes beyond the mouth, throat, and stomach. For me, it manifests as a sensation that creeps up my back. For others, it’s a different reaction. Great tea will usually be accompanied by this — an obvious sense of qi rushing up. It is something special, and a lot of teas do not have such a thing. This is not to be confused with a caffeine high, however. They are most definitely not the same. So, having stared at the tea for a while, it’s time to drink. I could talk about smell, but I think that should really go into a separate category as it’s not as useful and informative. I should note that while this sounds rather systematic, normally when I drink tea I don’t really think about any of these as a process or a series of steps — they just happen more or less naturally. Too much thinking is, I believe, bad for tea drinking. Drinking tea is not like drinking wine. You don’t just open the bottle up, pour, let it air a bit, and then taste. How the tea comes out depends on what you put in, and the inputs are 1) leaves and 2) water, all through the use of some teaware. So the variables, in addition to the leaves, are really water, vessel, and method. I think there is probably no optimal way of testing a certain tea. My rule of thumb these days is to look at it, evaluate it, and estimate how I would brew it. I think the best way to make a new tea that you’re not familiar with is to make it like you would normally do for that style of tea. The reason I say this is much like how audiophiles listen to a few recordings they know well to test a new system — it’s familiar to you, and it’s what works for you. I also say this because water can be a big contributor to the taste of a tea, and how you manage your brewing is dependent on your normal water source. If you always use filtered tap water, then there’s no good reason why you should bring out the $10 bottle of spring water for a new tea you’ve never tried. In fact, you will not be able to tell if the tea is any good, because you are not familiar with the water. Also, as the water changes, adjustments need to be made for how to brew. Lastly, if you normally use filtered tap, for example, then you should use that to check to see if the tea will be good using your normal water. If it won’t, then the tea is not for you, no matter what others say. The same, I think, can be said of vessels. I used to subscribe to the theory that when testing new tea, one should use a more neutral teaware, such as a gaiwan. This is because gaiwan, being made of non-porous porcelain, does not impart any particular taste to the tea, making your evaluation more “true” to the original taste. But then, applying the same logic I used for water to teaware — if you normally only use pot X for tea Y, then why are you, all of a sudden, using a gaiwan for tea Y? It’ll change the flavour (and sometimes significantly so) so don’t mess up what you know. In terms of brewing parameters, this can be a little more tricky, because that can sometimes change dependent on the tea — the roasting level, aged-ness, etc, should all affect how you brew the tea. This is why looking at the tea is important — it gives you the clues you need to figure out how to brew it. Adjustments can be made, but once started, it is hard to go back and fix a session with one tea. It’s better to get it right the first time. So what do I actually look for, now that we’ve got the more technical stuff out of the way? a) Looking for problems. I think the first order of things for me is to look for problems in a tea. This can be any number of things — over roasted, in the case of oolongs, sourness, bitterness without huigan, off flavours, smoke when there shouldn’t be smoke, weird tastes/smells that are not natural, thin body, any feeling of discomfort, etc. The list is quite long, and can include any number of things. 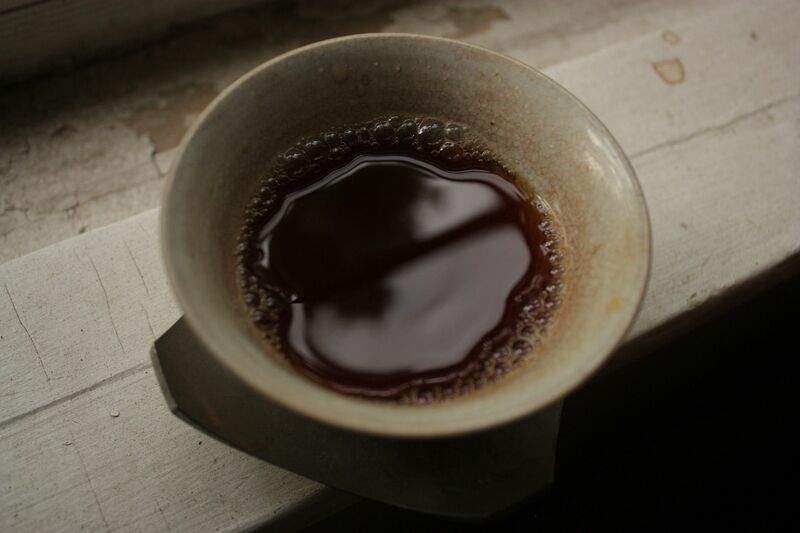 Some are more of a “sin” than others — smoke in young puerh I can tolerate, for example, up to a point. Likewise, a bit of sourness in an aged oolong can be ok, depending on other factors. Negative things, however, are almost always my first impression of a tea when I try it. This, of course, starts with the smell — you smell the brewed leaves, you smell the liquor, and then you taste it. Once you’ve had enough teas before, just smelling something can give you a fair idea of what’s coming your way. b) Tasting for goodness. I think only after I get the negatives out of the way do I feel the more positive side of things. They go, more or less, hand in hand. In some ways, my definition of a good tea these days basically means a tea that doesn’t have any obvious faults. If it’s got a good body, no odd/off flavours, sourness, unpleasantness, or any of those sort of things, then it’s already not too bad. After that, it’s really a matter of personal preference. Do you like the fragrance of one over the other? Do you prefer stronger or weaker roast? Do you expect a kind of body over another? Since these are all variables that are dependent not only on the tea itself, but also on the way it’s brewed, I won’t go into them. Another thing I do with drinking tea is to push them to the bitter end – these days, this usually means at least two full kettles worth of water. I think it’s often the latter infusions that tell you the true taste of tea. Any tea can be great the first two cups. Will it last for twenty though? The ones that do are, I think, inevitably better in other respects as well. I think I’m not alone here in being asked, more often than warranted, the question of “how do you know what’s a good tea?” It’s a question that teaheads get asked by their friends often, as we seem to have some nominal expertise on the subject. I find this question to be particularly difficult to answer though, because it is actually quite complicated in a very nerdy way, and which requires a great deal of experience to at least make sense of. Otherwise, it’s just talk and means very little. Most of the time when I evaluate a tea that I have not encountered before, I look at it as an aggregate whole without really breaking it down into pieces. That, of course, doesn’t help anybody, so I will try to do it here. Price is a separate matter, and I will talk about that in another post. 1) Shape. I think this is obvious, but looking at a tea’s shape can tell you a lot, if you know what you’re looking for. For longjing, for example, you can usually tell the grade of the longjing just by looking at it — fat, thick, light coloured ones with lots of fur are usually high grade, whereas dark, thin, papery ones are normally low grade stuff. That, at the very least, establishes a baseline. There are also signs, such as the way the tea is made and the way it’s shaped, such as the tightness of the rolling and the level of oxidation, for certain oolongs, for example. This can come in handy in evaluating some vendor claims. For example, someone who’s telling you a tea is really a 1980s TGY from Fujian, and you see the tea is tightly rolled — something’s not quite adding up there. Lastly, and this is the most obvious — the shape of the leaves tell you what type of tea it is. Learning to recognize all these things are important. Some, of course, are harder than others. Different kinds of black tea can be very difficult to tell apart form shape alone. Likewise, yancha of various sorts are nearly impossible to tell apart without additional clues. Oolongs and greens, and to a lesser extent puerh, can be at least broadly distinguished using shape alone. 2) Colour. 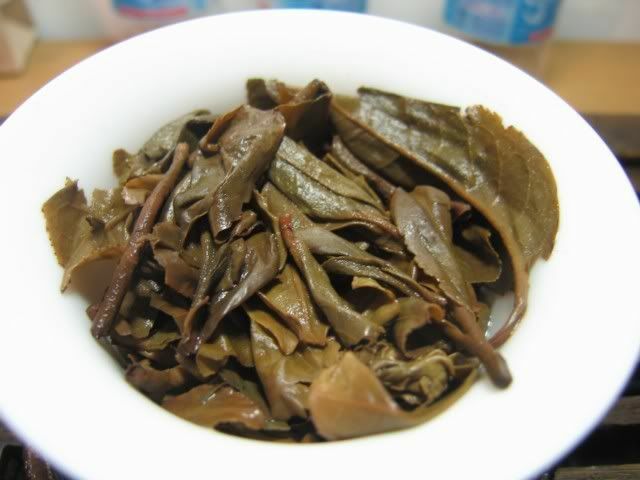 Something I already alluded to above — the colour of longjing leaves is a big clue as to its quality level. The best way to learn such things is to, unfortunately, go to a tea store that has a variety of grades of the same tea, and just look at them, together. I remember doing this at various places at various times, the first was probably at Great Wall (now defunct) in NYC’s Chinatown, where they put all the teas in glass jars and where I first had a taste of a really expensive longjing (of which I paid for, therefore being acutely aware of its price). The gradations then become very clear. It’s more difficult to achieve this by purchasing the “same” tea from different places, because then the grades can be very mixed and you won’t get the same effect. The same can be said of tieguanyin, although these days many light or no-roast tieguanyin are basically nuclear green. The various colours of an oolong, however, are clues as to their level of oxidation, and very useful in determining how to steep a tea. 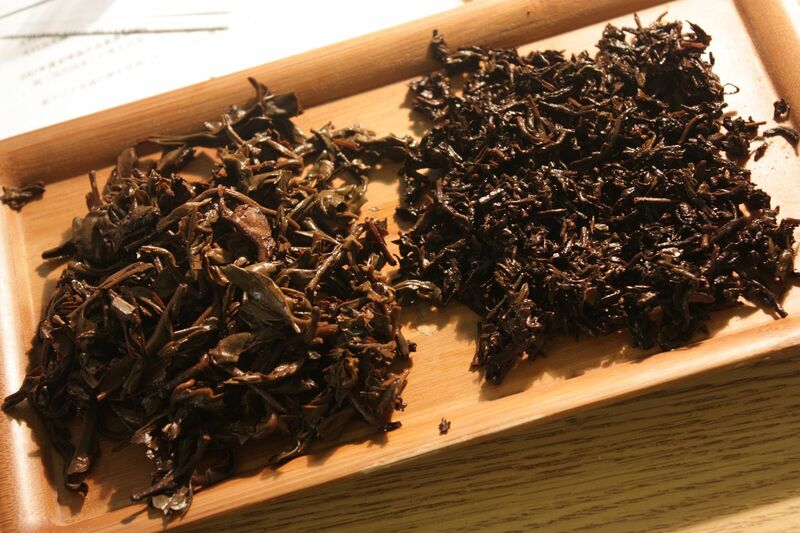 Obviously, the colour of puerh leaves can instantly tell you if a tea is raw or cooked (combined with other physical attributes), and roughly, its storage condition. 3) Size. Size matters, although in different ways for different teas. For some teas, size does not, in any way, denote quality. Puerh, for example, largely falls into this category, where the size of the leaves have very little to do with how good or bad a tea is. A cake with large leaves can be terrible, while one with small leaves can also be terrible. It does not tell you what season the tea is picked, nor does it tell you where it’s from. At most, it can tell you what it’s NOT — broad, large, and long leaves means it’s not tea from certain regions that only have small leaf varietals, for example. That’s really the extent of it. Then you have things like oolongs, where size, again, tells you relatively little. It’s very difficult to evaluate ball shaped oolongs and the size of the leaves, and since we’re sticking to the pre-brewed tea at this point, I’d refrain from commenting on that. For oolongs the size often has to do with the roasting level, which is also betrayed by the tea’s colour. The roasting process, when done properly, would normally result in some breakage of the leaves. Also, size, for some teas, does denote quality, or perceived quality, at any rate. For example, for lapsang souchong. I think in terms of purely looking at a tea physically, that’s about it. More later. I didn’t realize that it’s possible to grow mold in heavily chlorinated water, which is what I get from the tap. I added some water to two glasses and put them in my storage closet for my puerh. I left them there for a few weeks, figuring there’s no reason to bother them since they had not evaporated. 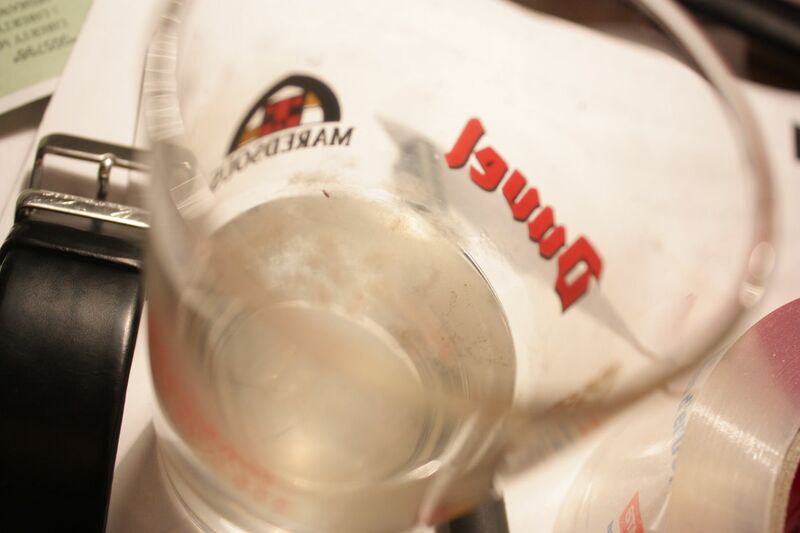 I went back a few days ago to check on my tea, and I saw a thin film of white and black mold on the water. Yum. The tea, however, is fine — no evidence of mold outbreak. Not sure what to make of it, really, but this is a first. Drinking bad teas is a very, very unsatisfying experience. Now there are a few different ways of “bad” that I can think of. 2) Badly processed/stored — usually with this kind of thing you can pinpoint something wrong with it, either in the processing or the storage, or both. Poorly stored puerh (too dry or too wet) can fall into this category. Teas that are made with wrong or bad processing methods can also fall into this category. 4) Bad value — this is usually a tea that is on the margins, but the price did it in. An ok tea at $10/lb might be perfectly fine, but if it’s $100/lb, or, for example, a lao chatou selling for an egregious $150CDN, then it can be downright criminal. Usually with 3, you can spot it without drinking it. Even 2 is sometimes obvious. 1 is harder to tell — the tea can often look quite ok, but a few cups in, I would want to bail on the tea. I want to stop, and start again with something I know is good, something I like, something that will make me feel like it’s worthwhile to drink. Most of the time, bad tea is not a problem that I have, but sometimes when I sample, it happens. Today’s one of those days, and the tea, unfortunately, falls into the 1 category. I tried the YSLLC 2010 Yiwu. Now, knowing the price of good raw materials from Yiwu this year, I know this price of $16 for a cake is really in the “too good to be real” category. But then, since YSLLC probably cuts out quite a few middlemen, I figured it’s worth giving it a shot. Unlike the Gedeng, which is fine, the Yiwu is not anything I’d recognize as Yiwu at all. The tea has signs of poor processing, but also doesn’t seem to be from the Yiwu region — it certainly doesn’t taste like anything I’d recognize from Mahei, or at least anything decent coming from Mahei. What I find is a rather odd tasting tea with some strange flavours, and a fair amount of smoke. Not impressed. Then again, I do, sometimes, change my mind, so might give this another go some other time, to see if my initial impressions are right. But as it is, there are better bets than this tea. As I mentioned in my last post, I bought a bunch of samples from YSLLC recently, with the intention of trying out some of the lesser known cakes, some of which are of the YSLLC label. The first I tried among these is the Gedeng, which is one of the six famous tea mountains in Yunnan, but one which has almost no tea trees left because they were decimated over the years (mostly growing rubber trees now). Gedeng, like some other mountains (such as Youle) have generally small leaf tress. This is in contrast with Yiwu and Manzhuan, for example, which have large leaf trees. The teas behave somewhat differently because of that. Initial impressions of this tea is that it’s quite decent. It’s got some strength, but not overly so, and lasts a while. It seems to be processed decently, and the price is not terrible. However, I find myself not used to drinking fresh puerh anymore. I much prefer the taste of something a little older, preferably stored in somewhere desirable. Tomorrow maybe I’ll give the Yiwu a spin. 1) To determine whether or buy something or not. This one’s pretty obvious. It is also always useful. 2) To broaden your sense of taste. This is why I buy most of my samples. A lot of the samples I bought this time are from YSLLC itself — the cakes that Scott pressed in the past two or three years of various mountains. First of all, I’ve never tried any of his pressing, so I’m curious to see what they are like. I also bought a cake of Bulang from a no-name factory (in fact, the paper is white). I find that these are often more interesting than big factory stuff. When I get a cake of Shuangjiang Mengku Ronshi tea, for example, or a cake from Menghai factory, you more or less have an idea what it’s going to be like, how it’s going to be processed, and roughly how it’s going to go down. There are usually very few surprises, and what surprises there are, they are often because the tea was stored strangely, or fake. With the smaller factory stuff, however, that is not true. You often get a lot of teas that are pretty strange, or interestingly processed. They could be good or they could be bad, but they are almost always a learning experience. So for today’s tea, which is the said Bulang, I brewed it in my usual pot. I find it to be quite green, still, even though it’s 2006. I’m sure Kunming storage has something to do with that. It does have a few years in that the taste is starting to turn, ever so slightly, but it is a long way from mature. I can guess that it was, when made, quite a green affair, and pretty bitter. What is really interesting for me though, is that it is very different from what I normally drink these days. The first taste of the tea brought me back to when I was in Beijing in 2006 and tasting my way through hundreds of cakes. 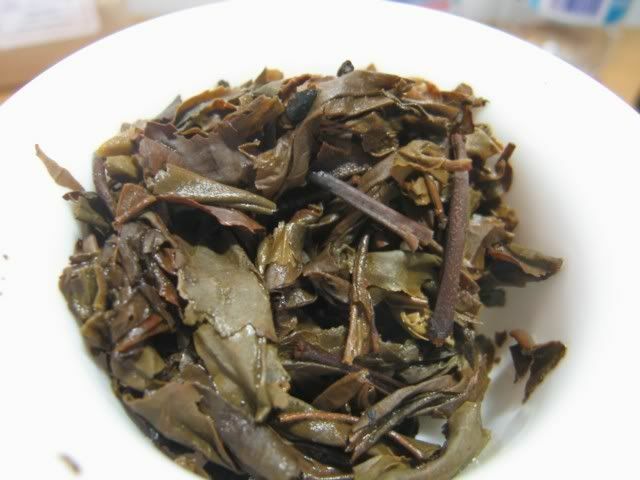 I noticed that these days, my standard fare is usually something pre 2007, or aged, or aged oolong, or wuyi. There just isn’t room for some of these younger drain cleaners. I should probably make a little room for them and to evaluate how the newer crops of tea are doing.